Yesterday, we showed you the Jordan IX uni-blue set to return this spring, but there’s another IX on the way for summer. This Jordan Retro IX Black/White/Citrus hits Foot Locker and House of Hoops on July 3rd. Unlike the uni-blue release, the citrus is a brand new color concept for the IX. The upper is black leather, rimmed with black 3M piecing. 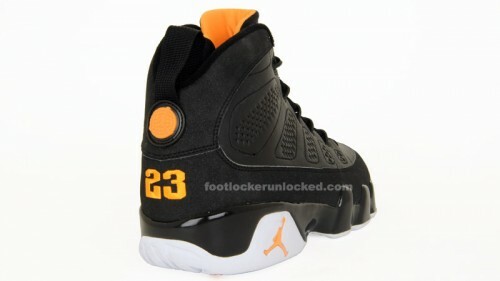 More hilights come from the citrus Jumpman logos, tongue lining and “23” stitched into the heel. The sole contrasts the upper by being clean white anchored by a citrus Jumpman on the heel. More shots in the Gallery.